I grew up in the shadow of the Great Falls, Montana smokestack. Sadly, it was demolished after we moved away and by the time I came back "home" as an adult, it was gone forever. I've discovered that I have a real fondness for memorabilia that features the stack and have started prowling eBay, etc. I am also slowly piecing together a decent "rebel pilot" costume and I'm always looking for appropriate parts like a US Navy (Vietnam-war vintage) APH-6B helmet, etc. 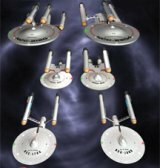 Convoy (Starfleet Games - Amarillo Design Bureau) - I need a couple of these.